North Uist featured in the BBC TV programme Monty Halls' Great Hebridean Escape. Local transport includes planes, buses, ferries, car hire. All sorts of tours are available whether you want to go hiking or cycling (alone, with friends or in a group), or travel on a guided coach trip. Click here for local travel details and info on how to reach the islands. 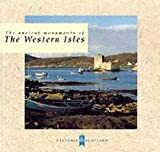 Books and maps about the Uists and the Hebrides are available to buy online. The Heb - Race on the Edge (an accessible multi-discipline Adventure Race Solos and Pairs) will be held on . Participants will be biking, running and kayaking up and down North Uist, Benbecula, South Uist and Eriskay. See photos and latest info on Facebook. The	Western Isles Wildlife web site includes the latest sightings and photos of birds, mammals, insects and flora of the Hebrides. Steve Duffield offers guided tours throughout the year. These can be 6-night all inclusive tours including accommodation, or simply book him for a day tour or a half day tour (mob: 07867 555971 / tel: 01876 580619). Lady Anne Boat Trips offer wildlife watching cruises around the island of Ronay or to the Monach Islands. Contact Nick on 01870 602403. For information about where to fish on North Uist, consult the North Uist Angling Club. A pleasant village with general store, post office (first opened in 1829), Bank of Scotland, craft shop, filling station, pontoons for yachts, inn and hotel. There is a visitor centre called Taigh chearsabhagh on the left-hand side of the road when you are heading down towards the ferry pier. It has a museum, arts gallery, small gift shop and cafe (tel/fax: 01876 500 293). Open 10am to 5pm Monday to Saturday all year. Toilet facilities are available inside the visitor centre and others are accessible to the general public from the road side of the building when the centre is closed. About 100 metres from the centre is a mosaic of a mackerel made from local stone laid out on the rocks (follow the sign from the visitor centre along the wooden walkway). There are also other unusual sculptures in the Uists as part of the Road Ends project. If you are in Lochmaddy on a Sunday, you will see most of the island's population at the Church. If travelling by car, leave your vehicle in the parking space just before the road turns left to the Uist Outdoor Centre in Lochmaddy. In front of you to the right is a house at the very end of the road - walk down the track which leads towards the sea on the right. Continue following the track which becomes grassy and enclosed by high fences. It leads you to the small suspension bridge which crosses over to the Sponish peninsula. Once over the bridge, take the track down to the right towards the sea and you will reach the Sea / Sky Chamber. This is well worth a visit and you may be able to spot otters in the vicinity if you are patient. Completed around Easter 1997 with the help of local people by English-based artist Chris Drury on behalf of the Lochmaddy arts centre, it is a modern tribute to the makers of prehistoric constructions and sits near the end of the rocks like a miniature ancient monument. Open the wooden gate which protects the building's interior from the island's many sheep and crouch down to make your way through the narrow, low entrance passage. Once you are through this short, curved passage, you will emerge into a small chamber where you will see a pinhole on the opposite wall. You may need some time to allow your eyes to adjust to the dark but it will be well worth the wait. You will discover that the chamber is high enough for you to stand up in (unless you are really tall in which case watch your head!). There are two stone seats in the wall in front of you, either side of the pinhole which is letting in light from the outside. Sit on one of the seats and look at the light falling onto the internal (flat) wall of the building. When your eyes are accustomed to the dark, you will see a picture emerging on the wall - a perfect projection of landscape outside. Depending on the brightness of the daylight outside, the picture may or may not be colourful. Despite poor daylight when I visited late in the day, I was clearly able to see the projection of the mountains, sea loch and rocks which are situated outside the chamber. If you focus properly you can even see the waves of the sea lapping away. An enthralling experience. Unfortunately it was a grey afternoon when I was there so the scene mirrored the greyness outside, but on a sunny day, the effect would be even more exciting. The chamber is effectively a camera obscura with a mirror and lens projecting the external scene onto the internal wall. There are many sites of historical interest scattered about North Uist. Some are near roads, others are harder to reach. Check with the Tourist Office when you get there to make sure of access and buy yourself a detailed map of the area (preferably the Ordnance Survey map). Taking the road from Lochmaddy southwards towards Clachan, you will see signposts for Langass Lodge. Park off the main road either by the gate to the Lodge road or on the opposite side of the main road where there is a derelict old house. Walk back up the road a little from this junction and on the south/east side of the road, look up the hill and you will see the Barpa Langass Neolithic cairn about 150 metres away. You can climb over the fence at a certain point and walk up the hill. Be warned, this can be very boggy (certainly was when I was there!). However it is well worth it. The monument is huge at some 25 metres in diameter and 4 metres high. It has an intact burial chamber. You can peer through the entrance (take your flashlight and crouch down) but it is not safe to enter. The views of the surrounding landscape are impressive too. One kilometre south-east of the Barpa Langass cairn are the remains of a stone circle, Pobull Fhinn. You can follow the track over the side of the hill from Barpa Langass to get to the stone circle. I saw a stag when I was there. Alternatively you can visit Pobull Fhinn first and then take the track to the burial cairn. Either way, you can do a complete circle by leaving your vehicle by the main road as suggested above. The standing stones are within easy reach of Langass Lodge which is at the end of the side road signposted from the main road. However the Lodge car park is for residents only, so it is not advisable to park your vehicle there (that's why I mentioned the spots you can park by the main road to see Barpa Langass). Once you have walked to the Lodge, you can read the information board to the right of the road and get the background on the sites. To reach the stone circle, you have to go through the Lodge's gate, down the side of their garden, and then turn up the hill on a boarded walkway. 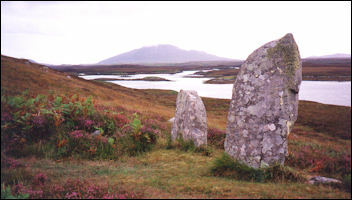 You soon see the stones in front of you and it is quite an impressive circle overlooking the loch. As you reach the stones, look directly in front of you and behind you - is there an alignment with the stones and the hills to the north-west and the south-east? More of my photos are online. This is the junction between the main loop road of North Uist and the road heading south to Benbecula and South Uist. It has a small grocers shop and some public toilets in portacabins situated on the sea-side of the A865. The Hebridean Smokehouse offers delicious smoked salmon and seatrout, which can be purchased from the smokery shop or via their web site. Two miles north-west of Clachan is the Claddach Kirkibost Centre which includes a cafe with free WiFi. Tel: 01876 580390. If you continue on the loop road, you will pass a hill called Unival (or Uneabhal in Gaelic) in the interior of the island. Somewhere up there is a Neolithic chambered cairn and late Iron Age cellular house (map reference NF 800668). To reach it you apparently attack the hill from the so-called Committee Road which cuts across the island (from the south-west side of the loop road to Vallay in the north). From that road it is an uphill walk heading east-south-east to get to the site. Do not attempt this unless you have an Ordnance Survey map and appropriate footwear/clothing for the moorland. Huge RSPB bird reserve located in the west of the island. At Bayhead you can also visit the Uist Animal Visitor Centre - tel: 01876 510706 to find out more. In the west of the island, take the road from Tigharry to the summit of South Clettraval (133 metres high). 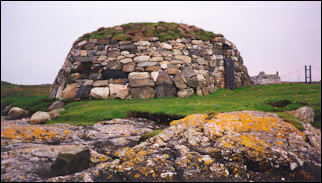 Here you will find a Neolithic chambered cairn of the 'Clyde' type, unique in the Western Isles, and also an Iron Age wheelhouse (map reference NF 749713). Here there's a natural rock arch and spouting cave. Nine metres from the edge of the cave's roof is an opening which has been worn through the upper portion of the rock to form a perpendicular shaft 6-8 metres across. During storms, water shoots upwards 60 metres into the air. Built in 1830, possibly mainly to provide work for the local people. It was commissioned by Dr. Alex MacLeod. It can be accessed on its islet if you walk carefully over the stones to get to it. The interior was empty but for a bird in its nest when I visited. Stop at the phone box on the left of the road at Greinetobht and read the information board about this area. You may wish to leave your car near here as the track down to the beach is full of pot holes - drive it at your peril! If you do go down to the sea, you will find a huge expanse of sand and there are ancient monuments if you can find them. One is a 3000 year old recently discovered Neolithic site which has been fenced to preserve it. Continuing clockwise on the loop road of North Uist, you will pass this typical Hebridean looking cottage on the shore of Vallay Strand, about a mile before you reach the township of Sollas. Struan Cottage is rented out as self-catering accommodation. The Sollas township in North Uist was formed in 1899. Click here for information provided by Donald Macaulay who owns the holiday cottage. 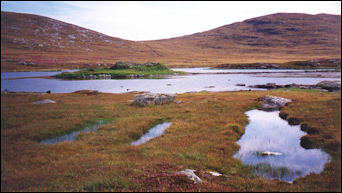 Visible to the inland side of the road on a small loch after Sollas and before the turn to Port nan Long (Newtonferry) which was the old ferry terminal for the isle of Berneray. Berneray is now joined to North Uist by a causeway. Population 128. Great sandy beaches. The information centre inside the Nurses' Cottage is open 11am to 3pm Monday - Friday from June to August. Visit the Isle of Berneray community web site for full details. The Caledonian Macbrayne ferry sails from the island over to Leverburgh on south Harris. Accommodation on Berneray includes Seal View B&B (tel: 01876 540209). The Smiddy at Burnside Croft offers self catering for 2 people. The fleeces from Boreray's flock of Hebridean sheep are now being turned into an exclusive range of knitwear (click here for details). If you take the turn to Newtonferry (Port nan Long in Gaelic), then before you reach the old ferry point, you will find Loch an Sticir as the road turns right. 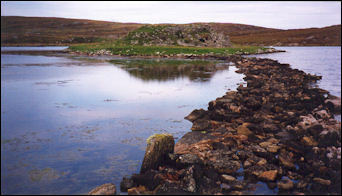 Here on an islet is a broch known as Dun an Sticir which has a late medieval hall (map reference NF 897776). Walk across the boggy moorland to the original 3 stone causeways which connect across the water with the islet. The rocks can be somewhat slippery and so you need to be reasonably sure-footed to get there (and back) safely! Once on the islet, you can walk around the structure and climb inside if you don't mind all the overgrown vegetation (and possibly midges!). You may see swans in the loch. Return to the main road heading south to Lochmaddy and if you spot the turn on the left-hand side of the road to Lochportain, then you might see the broch known as Dun Thorcuill (or Torcuil) (map reference NF 888737) which sits on an islet (with causeway) in Loch an Duin. Continuing south a couple of miles on the main road to Lochmaddy, about 3 miles before you reach the village, climb Blashaval hill to the right of the road and you will find 3 standing stones known as the Three False Men or Na Fir Bhreige. Legend has it that these mark the graves of spies who were buried alive. You'll find them on the western slope of the hill and will need to trek across the moorland to get there. This completes the loop back to Lochmaddy. If you are heading down to Benbecula and South Uist, you will take the A865 road leading directly south from Clachan. On the main A865 a few miles south of Clachan, near Carinish (Cairinis in Gaelic) are the ruins of a 13th century church (Teampull na Trionaid), thought to have been founded by the daughter of the warrior Somerled. Once you have turned off the main A865 road, you get to a parking space and interpretation board. Go through the gate and it is about 200 metres walk. Surrounded by irises, it is full of thistles inside. 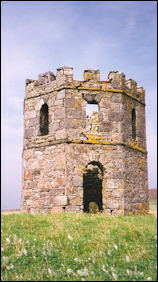 Englarged between 1350 and 1390 by Amie Nic Ruari, first wife of John, Lord of the Isles, it was much later reconstructed in the 16th century, but destroyed after the Reformation. 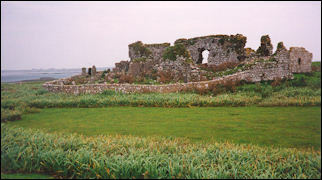 A chapel was added onto the side and later restored in the 19th century by Dotair Ban. 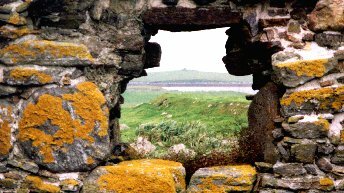 I found this to be quite an atmospheric, peaceful spot with the yellow lichens on the walls and a beautifully preserved window aperture, set looking out to islands in the sea in the distance. You can wander around the ruins and there are many gravestones. A long cairn, dun and stone circle can all be found east of here apparently. If you are continuing south - then you will be crossing the causeways over Grimsay to Benbecula. The new community centre Ceann na h-�irigh is run by the Grimsay Community Association. Regular events including talks and local produce/craft markets. Grimsay is well known for its boat building (see video about the Grimsay Boatshed Trust). Today there are still boats working out of Kallin Harbour. You can also take boat trips on the Lady Anne to see local wildlife. Contact Nick - tel: 01870 602403. You can see the remains of an Iron Age wheelhouse in Grimsay - see video about its history. Uist Wool has a spinning mill and wool centre open to visitor on Grimsay at 5 Scotvein - tel: 01870 602597. Lovely colour guide published in 1999 with over 100 pages of photos devoted to these islands. Covers local heritage and culture, nature, the landscape, places to visit, etc. Written by Francis Thompson. Even if you don't get chance to buy it before you go, you will certainly want a copy for a souvenir when you have visited! This is one of the Pevensey island guide series which also includes a similar book on Lewis and Harris. Both available to buy online via Amazon.co.uk. Very nice additions to my bookshelf. North Uist has a fascinating history, and a landscape scattered with historic sites, from Neolithic burial chambers and Iron Age forts, though medieval churches and battle-sites, to townships forged in the days of kelp trade, and the subsequent traumas of clearance and emigration. Of all the Western Isles, none has closer links with the turbulent history of Clan Donald than North Uist, and stories of their chiefs and battles are linked with sites all through the island, all set in a landscape which is one of the most varied and beautiful in the Hebrides. Bill Lawson has woven a tapestry of stories about the island and its people, drawing on formal recorded history and also the rich tradition of story and song in which the informal history of the people was passed down, but also incorporating many of his personal reminiscences of his travels through the island, to give a unique insight into North Uist and the life of its people through the ages. This is an excellent visitors' guide to the main historic sites and monuments on the islands. Very readable, lots of photos and drawings. The book takes you from the prehistoric, through the early Christian period and Norse settlement, to the building of medieval churches and castles, and later traditional dwellings such as the blackhouses. If you are looking for Hebridean genealogy research material or historical books, visit the web site for Bill Lawson Publications (specialist in Hebridean family tree research). There is a range of hotels, B&B and self-catering accommodation available on the islands. The ones listed in the tourist brochure are given on the official Western Isles Tourist Board web site. The Tractor Shed offers accommodation in a bunkhouse (male 4-bed dorm and female/couples 4-bed dorm) and fully insulated turf roofed camping huts (for 2 or 4 people). 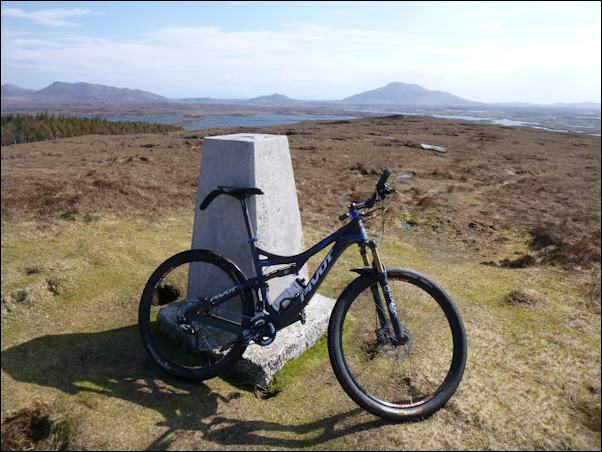 Situated on the west side of North Uist at Paible close to beaches, RSPB Balranald and The Hebridean Way cycle route. Open April to October. Facilities include: laundry, 24-hour hot water, fully equiped kitchen and dining area, fully equiped campers kitchen, peat fired camping stoves, fire pit and BBQ, secure bicycle parking. Mobile: 0795 2163080. 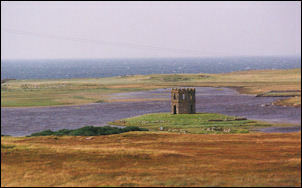 Moorcroft Holidays is 1 mile south of Carinish village. Tents, caravans, motorhomes, bunkhouse. Tel: 01876 580305. Open April - October. Tigh Dearg Hotel in Lochmaddy features 8 designer bedrooms, a contemporary restaurant and a fully equipped Leisure Club including Sauna and Steam Room. Tel: 01876 500700. Near the pier is the Lochmaddy Hotel (tel: 01876 500 331). 15 rooms. This is a long-established hotel which is excellent for local fishing. Ardnastruban House is a 4 Star B&B on the isle of Grimsay (between North Uist and Benbecula). 3 rooms (double, twin, single). Contact Margaret Wiseman. Tel: 01870 602452. Struan House offers B&B near Sollas, overlooking the sands of Vallay Strand. 10 miles from Lochmaddy. 1 family room & 1 double room, both on the ground floor. Evening meals and packed lunches are available on request. Tel: 01876 560385. The Rowan Tree Bed & Breakfast at Sollas offer quality accommodation in 3 ensuite bedrooms (2 double and 1 twin/king size). Free Wi-fi. Struan Cottage at Sollas is rented out as self-catering accommodation by Donald Macaulay. It is a typical Hebridean thatched cottage. Taigh Mairi is situated at the north end of the Grimsay circular road between Benbecula and North Uist. Fully equipped with 4 bedrooms, 4 bathrooms, utility room, kitchen and living room. Children welcome. Tigh-na-Mara (House by the Sea) is 5 star luxury self catering bungalow sleeping 8 in 4 bedrooms. Set overlooking the sandy beach at Claddach Kirkibost, North Uist. Tigh Alasdair is a self catering bungalow (sleeping 4 - 6) at Sidinish, Locheport, North Uist. Tranquil setting with hill and loch views. Fully equipped with 2 bedrooms, bathroom, kitchen, living/dining room. Tranquil Sands Holiday Home is a new bungalow with 2 bedroms (1 double, 1 twin), fully equipped kitchen/diner, utility room and lounge. Uninterrupted views and within walking distance to an unspoilt beach on the west side of North Uist. The Wooden House is a 1-bedroom self-catering apartment on the island of Grimsay.